I first heard about it 20 years ago from other members of the Los Angeles Science Fantasy Society. We were all fans of "Secret Agent," the British spy show. Now the star, Patrick McGoohan, had directed and starred in a new TV series. "The Prisoner" was due to appear on American screens. Some friends had already seen episodes from England. What was it like? Nobody could give me a straight answer. Hard to describe. Not a spy show. Cryptic. Surreal. You never knew quite what was going on. A dozen of us took to meeting at the home of Barry and Lee Gold to watch the show. It's still hard to describe. First: the opening. We watch McGoohan, in something very like his John Drake, Secret Agent persona, drive an idiosyncratic race car (license: KAR 120C) into an underground garage. He stomps through corridors. He rages across a desk at a person unknown. Thunderstorm sounds drown out what must be accusations. An automatic sorter picks out a card with McGoohan's picture on it. It's consigned to a file stamped "Resigned." The name is unreadable. McGoohan drives home. He furiously packs a suitcase. A cadaverously tall man in formal dress and a stovepipe hat, a classic undertaker, limbs stairs to McGoohan's house. Gas streams through the keyhole and under the door. McGoohan starts, then falls over. He wakes bewildered, in a strange place: "The Village." Patrick McGoohan as "Number Six"
A man who identifies himself only as "Number Two" addresses McGoohan as "Number Six" and demands information. McGoohan refuses to cooperate. "I am not a number!" he shouts. "I am a free man!" Various episodes give us more details, but it's a jigsaw puzzle with pieces missing. Where is the village? Who is running it? Why was Number Six imprisoned? Number Two appears to be in charge, but each episode begins by introducing a new Number Two. The questions are constant. So: the Village. It's a kind of luxury high-tech prison. Number Six is one of several hundreds of prisoners, any of whom might be Establishment personnel under cover and any of whom might be subverted. They live a life that is almost normal, subject to compulsory rituals and makework. Life in the Village echoes life in some calm British backwater, with glimpses of advanced technology and touches of life in a prison or an insane asylum. The doors of the houses open and shut by themselves (or sometimes lock themselves). There are cameras inside and outside; there are not even closed vehicles; no privacy is possible. The guards are not always visible, but they're always there. Number Six's commitment never falters. He will resist the Establishment's attempts to control his mind and actions, and he will escape. The Establishment's commitment is to break his spirit and learn his secret. "Why did you resign?" Number Six finds it impossible to learn where he is, who's running the Village, why he's there, what they want of him. Maps show the Village surrounded by sea and unknown terrain. From time to time Number Six escapes and is brought back. Or thinks he has escaped, as part of some elaborate plot by his captors to learn his secret. It was wonderful. We sat around the Golds' living room and talked about what we had seen. I learned to whistle the music. I still can. The Village puts on an art show. Number Six's contribution is abstract art, three pieces of wood, titled "Escape." Number Six gives a senseless, pretentious explanation of its meaning; Number Two, as art critic, pretends to understand. That night Number Six assembles his entry into a boat and takes off. The establishment has trained a double, to rob Number Six of his sense of identity. His name? "Number Twelve." Number Two (different every show, remember) claims to know Number Six inside and out. His dossier is complete down to how he likes his tea (one lump). Oh, yeah? Number Six drops four sugar lumps in his tea, and Number Two turns purple with anger. As part of an attempt to set up a rebellion, Number Six begins acting as if he has authority. He'll be taken for a member of the Establishment! It works too well. He must be what he claims; he's luring his followers into rebellion in order to betray them. And one betrays him first. The odd thing was, I had no good excuse for liking the show. For Number Six and for the viewer there are no clear answers, no certainties anywhere. The Village may be real or may be an extended metaphor for society itself. The shapeless, translucent guard-things that smother escapees may represent the shapeless force of social pressure. The story line becomes ever more surrealistic as the series approaches those cryptic last episodes. Science fiction of the day was full of such stuff. Early science fiction had emphasized solid story lines with beginnings and middles and ends, realism or at least plausibility, innovative use of current science and engineering to shape fantastic environments, and strange cultures, problems, and puzzles with unique solutions. The New Wave of the '60s threw all that away in favor of other values. Characterization and social relevance got lip service. What emerged was metaphors and allegories, contorted stories and non-stories, and imaginative punctuation and typesetting. "The Prisoner" was everything I'd been avoiding— and I loved it. It was superior to other television fare, but that's easy. TV series in the United States... well, my English teachers would not have recognized them as stories. A series episode leaves the situation as it began. Otherwise the writers would get lost, and so would the viewers. In "The Prisoner" a story is telling itself... a cryptic, nebulous story, but with a clear progression of events. It develops slowly. In the first handful of episodes, Number Six always fails to break free. The Establishment wins every time. In the middle sequence, Number Six begins accumulating minor victories: freeing other prisoners, defeating Establishment plans inside and outside the Village. He's learning. By the last several episodes he's trying to manipulate the system itself and often succeeding. At the end he destroys the Village. Or does he? There were three spinoff "Prisoner" novels. I knew all three of the authors, and what they did was surprising. Tom Disch usually writes of hapless, helpless protagonists, the playthings of fate. In the series, Number Six was usually a man of action; but Disch broke him out in entirely passive fashion, letting him crawl out under a makeshift turtle shell while the rover guards bounced futilely around it. Ultimately Disch left him running loose. Hank Stine's story was an exercise in solipsism. The universe would vanish if Number Six ever fully accepted that he had escaped the Village. We discussed the novels. We heard tales of events during filming. We learned something about Portmeirion, the resort in North Wales where the shows were filmed. Portmeirion is an idealized village, a fantasy village, impossibly pretty. Barry and Lee showed us brochures. Some of us visited the place while in Britain for the World Science Fiction Convention. The locals swore they'd never do it again; the TV crews were always in the way. We learned that the guard-things were to have been robots. There was some trouble getting them to work. McGoohan's solution used weather balloons. 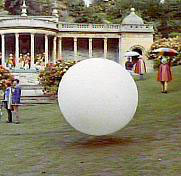 Ultimately the guards (at first nameless, later called "rovers") were translucent, mobile bubbles. They would run down an escaping prisoner and smother him into unconsciousness: a much better metaphor for restrictive social pressure, if that's the answer you like. The show fit the mood of the '60s... or did it? Rebellion, sure. Number Six is always opposed to the Establishment, always balls-out to regain his freedom, almost always operating alone. But he's learning how to manipulate the rules; he even runs for office... and he's over 30, for God's sake! Too old to be a hippy. Was "The Prisoner" a spy show? Sure, but there were always aspects of science fiction: the Establishment's technology, and particularly the guards. The premises became progressively wilder. At the end it verged on pure fantasy. Those last two episodes are the ones that start arguments. "Once Upon a Time" is a drastic version of what has gone before. Number Two wipes Number Six's memory (the Establishment has used such powers before), then sets forth to recap his entire life story. Number Two plays his father, teachers, drill instructor: every authority figure in Number Six's past. Gradually we watch Number Two lose control... until Number Six is running the show, hounding Number Two to death. The last blow comes when the butler changes alliance. He now serves Number Six. And then Number Six is summoned backstage. I was tempted to describe the whole episode, giving a mere list of events. But they kept piling up. What was important? Who went off in the rocket? Was the Establishment extraterrestrials? I hadn't mentioned Number Two's butler, the dwarf, "the little man" whom the politicians serve, though they sometimes forget. When Number Six breaks out and returns to London, with the reformed Number Two and the rock- singer/rebel/clown, "the little man" is there. When he enters Number Six's home, the door swings open by itself. I finally realized what I was doing. I described everything because I couldn't condense. You can't condense what you don't fully understand. Leave it at this. You've seen parts of what I saw when I watched "The Prisoner." What you see may be different. The 17 shows are available from Publishers Central Bureau. I hear rumors of a "Prisoner" computer game. I can still whistle the music. 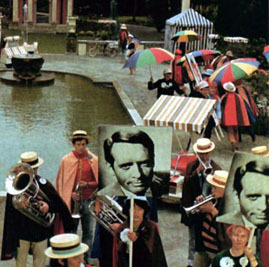 "The Prisoner" will always appeal to the type of people we were and are. We have never accepted our place in the Village. Originally published in Reason magazine, July 1987. Note: the photos below did not accompany the original article.